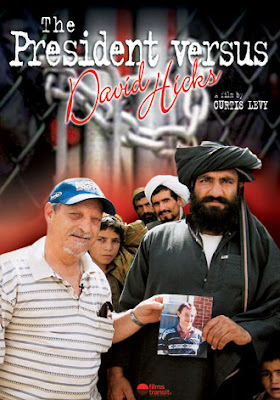 The President Versus David Hicks, by Australian film maker Curtis Levy, is [allegedly a] sympathetic portrait of the political prisoner. Arts Minister Rod Kemp has launched an inquiry into whether the filmmakers used a Film Finance Corporation grant to pay for Hicks's father Terry to travel to the United States to campaign for the release of his son. But more is needed and we need to ask Rod Kemp to finance more filmmakers to use Film Finance Corporation grants to pay for more decent films about the growing number of Australian political prisoners and their plight for freedom. In the US in July, Mr Hicks locked himself in a cage at New York's [reichstag] Ground Zero to get sympathy for his son, who allegedly trained [with the Taliban] in Afghanistan. Mr David Hicks has been held, [renditioned, and tortured in solitary confinement], at Camp X-ray at Guantanamo Bay, Cuba, for two years with hundreds of other suspected al-Qaeda operatives, [scapegoats and patsies, to bolster support for the Coalition of the Killing's illegal and degrading resource wars in the Middle East], including another Australian citizen, Mamdouh Habib. There are a growing number of political prisoners [because of these resource wars] and the war on liberty and these [scapegoats need our additional support] so the truth can be told about the [Coalition of the Killing and], fascist Australian authoritarian regime. [War criminal], and Defence [war] Minister Robert Hill said last week the detention of David Hicks had been raised with President George Bush during his recent visit. ASIO and the Australian Federal Police would soon visit Mr David Hicks and Mr Mamdouh Habib at Guantanamo Bay, a Senate estimates committee was told yesterday. Mr David Hicks has been listed for trial by a 'US military commission' [?] but no decision has been made about Mr Habib. DO YOU THINK MORE MONEY SHOULD BE PROVIDED FOR FILMMAKERS WHO ARE PREPARED TO TELL THE TRUTH ABOUT AUSTRALIAN POLITICAL PRISONERS IN THE WAR ON RESOURCES IN THE MIDDLE EAST? IN THE WAR ON LIBERTY?